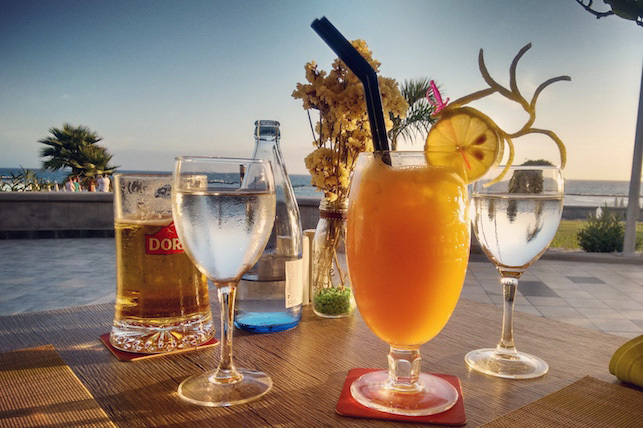 There are hundreds of places to eat in Costa Adeje, from cheap english style cafes along the beach to sophisticated cocktail bars. Scott and I like to eat out but it can feel overwhelming when you first arrive. Some of the places on this list we've been to before but others were chosen mainly with the help of tripadvisor as we were relaxing in the late afternoon. All are aimed towards tourists but we had some great meals (and cocktails) while we were on holiday. The Hard Rock Cafe is a massive tourist hotspot but my holiday wouldn't be complete without a visit. It was jumping when we arrived so we had cocktails on their rooftop bar before our meal. 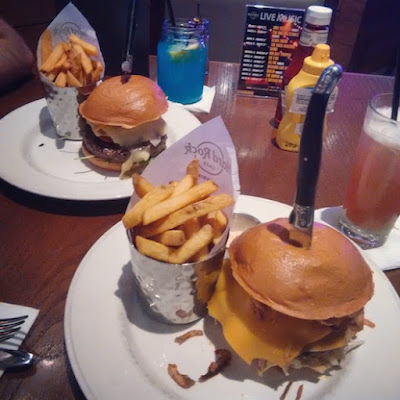 The food was delicious as normal and we both loved the burgers we choose. I had the banana berry colada to start our evening. Followed by the Tennessee BBQ burger and a port of mischief cocktail. Mostly I love the building which is seriously impressive and from the toilets you get a view of the new Hard Rock Hotel which also looks seriously cool. A similar American style restaurant - Scott and I both loved Harley's. Much closer to our hotel it had a delicious menu full of burgers, tex-mex and an extensive list of cocktails. 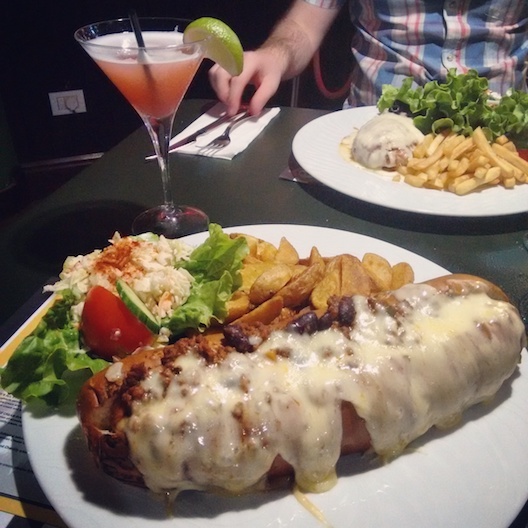 I opted for the chilli cheese dog with potato wedges. It looks massive but missing out some of the bread I almost finished it. I washed it down with a cocktail - I can't remember which one but I really enjoyed it. Plus the vintage cars outside are pretty awesome. 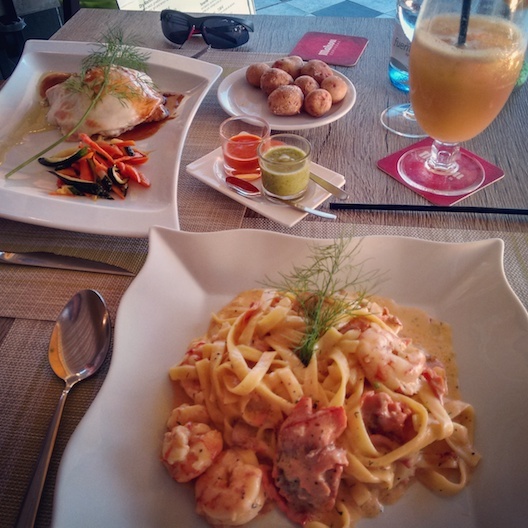 A second chain restaurant a trip to Tenerife wouldn't be complete without is Tony Roma's. I visited for two years ago and we also went to the branch in Orlando last year. I was burgered out by this point so I opted for their classic baby back ribs with fried prawns. 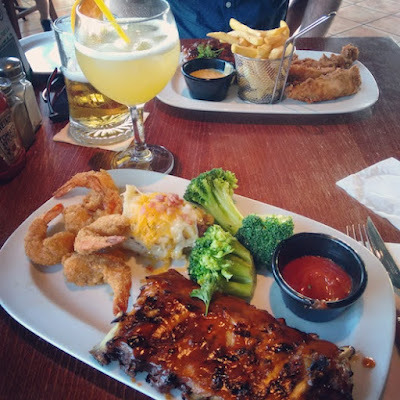 Both were mouth wateringly delicious and I enjoyed having something more than just ribs on my plate. Scott has the same but with fried chicken. You can see a theme here with cocktails - this time I think it was a bahama mama which was tasty. We left feeling full and very sleepy. 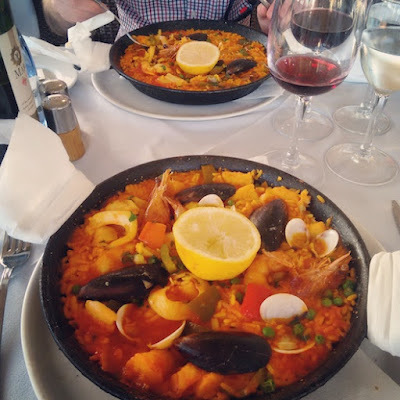 We visited Azar the last time we were on holiday and I still remembered how delicious their paellas were. Plus it is right on the beach so the views of the sunset are amazing. So this time we both had one - mine was just fish while Scott's was fish and meat. In hindsight I wish I'd chosen that one because there was starting to get alot of fish in mine. Washed down with a bottle of red wine it was another great meal of our holiday. It's just a shame we didn't have time to visit again. When Scott said he fancied an indian on our first night I was sceptical but went a lot with his suggestion. Right away their host was friendly and made us laugh. The two curries, rice and naan bread were all delicious. 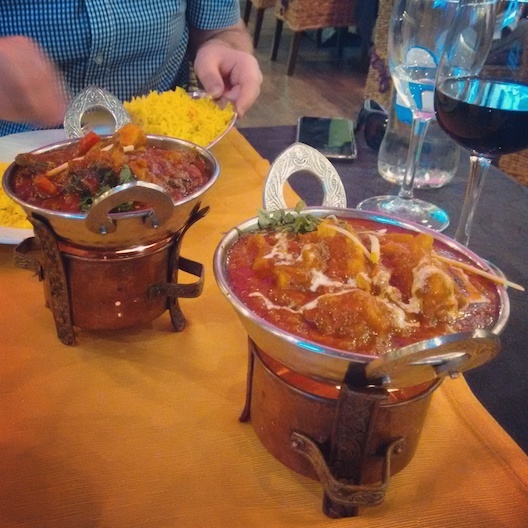 I couldn't fault it and I've had alot of curries. We enjoyed it so much we came back a second time near the end of our holiday. The host remembered us which was a nice touch and the food was equally good. We choose an even better bottle of wine (one we enjoyed so much we bought a couple of bottles home). This was one of the stand out meals of the holiday for me. Sat right on the beach promenade watching the sun setting over the sea. I had a hurricane cocktail which was a well needed refreshment. Craving pasta I chose the seafood tagliatelle. It was delightfully rich and filling. The staff in limoncello were attentive but not overpowering. The waiter didn't judge when I was trying to take the arty photo at the start of this post either. 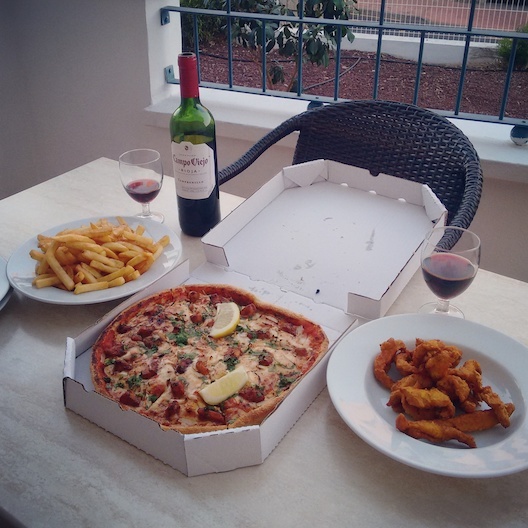 A pizza take-away on holiday seems to be a bit of a tradition now. After reading some tripadvisor reviews we choose Roy's Pizza who delivered straight to our hotel. I picked the pizza on recommendation from tripadvisor too and loved it. Pollo Barbacoa was fresh tasting. Is there anywhere better to eat pizza than in your jammies, outside on your own balcony. Who didn't say we were classy people? This post is a slightly different format to my normal posts - hopefully you enjoyed it. Please leave me a comment below!